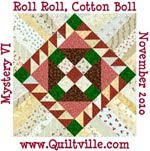 November 2008, Marolyn Floyd came to our quilt group to do a program on color. She discussed the color wheel and how to use it. Jenny Byers book on color and her palette were explained. Joan Wolfrom's book and 3 in 1 color tool and her book "Color Play" were discussed. Then a challenge was issued. Everyone drew a paint chip from a paper bag. The using a color palette, make a quilt. 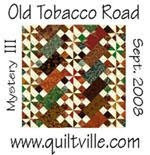 The pattern was passed out and we had a year to make our quilts. I drew a blue/green. This was a challenge for me since I lean toward blues and reds. We had our unveiling last week and here are pictures. I hope you like them. The quilts turned out beautiful. 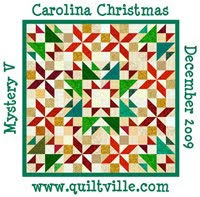 Since Marilyn is in our guild, we also did that challenge and I am always surprised to see how different the quilts turn out.